ATLANTA — Wabash National Corp. is diversifying from the dry van business, a recent Investors Day presentation made clear. But at the same time, the company’s commercial trailer products segment is gaining dealers and pushing ahead with new designs. In 2018, Wabash earned $1 billion in non-dry van revenue as the company powered its way to $2.26 billion in total revenue — the highest in its 33-year history. “As the commercial trailer product leader, never would I dare say we are relinquishing our position in dry vans. 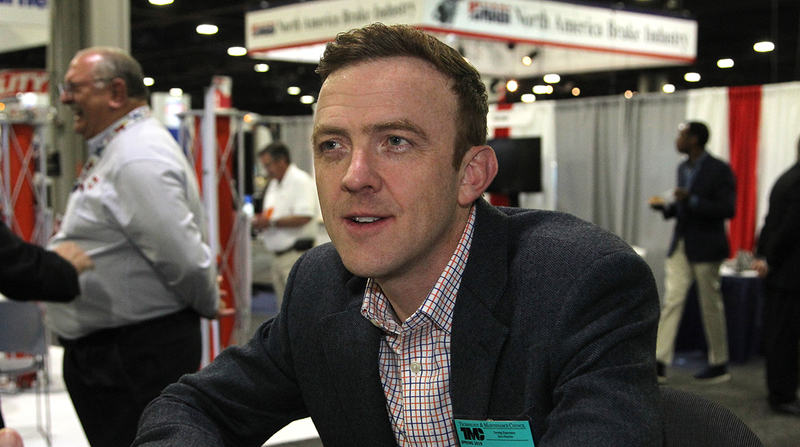 But when you have a leading position and the dominant product, it makes sense to focus on growth in other areas without getting too far outside of our wheelhouse,” Dustin Smith, group president of commercial trailer products (CTP), told Transport Topics. Smith made his comments at American Trucking Associations’ 2019 Technology & Maintenance Council annual meeting here. While forecasters note the core trailer market — dry vans, refrigerated and platforms — peaked in 2018, Smith said he expects demand to remain well above replacement over the next three years. Meanwhile, Smith said one effort CTP has been pushing over the past four years, and will push further in the future, is the growth in its dealer channel. Wabash has been able to partner with new dealers in the West, South and Southwest and increase sales in those regions, he said. Wabash also sells direct to large publicly traded fleets, Smith said. Smaller fleets go through the independent dealer channel that buys trailers from Wabash and resells them. The increase in dealers has “multiplied the company’s customer base,” Smith said, “and gotten our product in the hands of a lot more people." At the same time, CTP has been focused on the product technology, such as molded structural composites. What he meant by that, he added, was trailer makers have all been selling, arguably, a similar product for many years — versions of a composite plate trailer in the dry van space. While, in the refrigerated trailer space, the general product design and assembly have been similar across all the trailer makers. At TMC? Stop by Booth 3347 for a chance to win your own Amazon Echo or Google Home device. With MSC, however, it is not just substituting one type of material for another — such as taking out the wood floor and putting in an aluminum floor, which saves hundreds of pounds but adds significant cost, he said. “There is nothing, from an engineering standpoint, really interesting about that,” Smith said. Meanwhile, MSC changes the whole design of the trailer, he said, “We are actually engineering composites to form a new structure” and that creates barriers to entry. Its Cold Chain composite reefer is 25% more thermally efficient and reduces weight by up to 20% compared with trailers made with more conventional materials, according to the Lafayette, Ind.-based company. And the underside is 100% composite material with no metal cross members that would rust. Increased thermal efficiency means the refrigeration unit is having to run less often, he said. That, in turn, will lead to a higher residual value when the trailer is sold to a second user. But Wabash is managing that design change in a deliberate manner, he said. The company introduced MSC thermal technology in 2016, and has produced 100 MSC reefer trailers and 100 MSC truck bodies. In 2019, Wabash expects to exceed 1 million miles of total road exposure.